This has been a game that I’ve been looking forward to for some time. 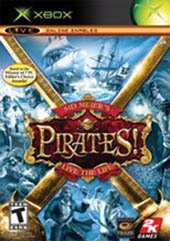 Pirates is one of those mega addictive games that you will be playing for a very, very long time. 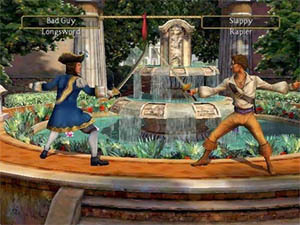 With the name Sid Meier involved in the title you know that you are in for a good game. Basically you are this kid whose family is abducted which sparks your quest of revenge! 10 years later you are a man on a mission who has been given his own easy to control ship and yo ho ho, it’s a pirate’s life for you! Graphically the game is simplistic looking but really does the trick with smooth gameplay and a fantastic flow to the whole thing. You can align yourself with one of four groups; The English, French, Spanish or Dutch. When you complete tasks for your chosen groups against the enemy you can get rewards and also carry favour with the hierarchy of your clique. Firaxis have made sure that the port from the PC version is a seamless occasion and the original open ended fun of the game is intact. One of the things that I like is the fact that you don’t have to even do the particular missions that are set out for you. Just do whatever you want and have as much fun as you can. If you just want to get around blowing up ships, then do it! The culmination of all ship-jackings is you facing off against the captain of the ship that you are trying to take over (if you haven’t blown them out of the water) as the rest of the crew fights around you in a desperate bid to win the day. 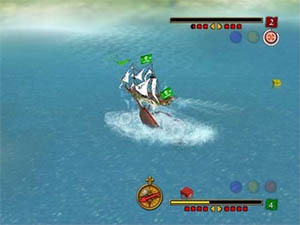 Depending on how many people you face on the enemy ship you can win more time to fight by pressing buttons in the correct sequence. Face to face combat involves choosing what weapons you wish to fight with and the standoff ensues until one of you is DEAD, DEAD, DEAD! After you win, (you will win, won’t you?) you can divide up the spoils of your plunder! For those of you wanting to get more out of the game, take the time to chose a port to make as a home base of sorts. You’ll find the townsfolk sympathetic and a lot more clues and treasure will be offered up to you, not only that but you just might find that you get offered a wife or two in the process. Go ahead, you are young and bigamy ain’t a crime if you don’t get caught! Finally the game shows how clever it is by keeping track of which country you are causing the most problems for and then reacting in a suitable fashion when you try to berth in their ports. You can really take advantage of this, especially when you are in it for the long haul. All things said and done, this is a title that demands your consideration. It’s stacks of fun and will give you hours and hours of fun.